April 16, 2016: Aurora Alien Encounter! Did You know a UFO crashed in Aurora, TX in 1897? 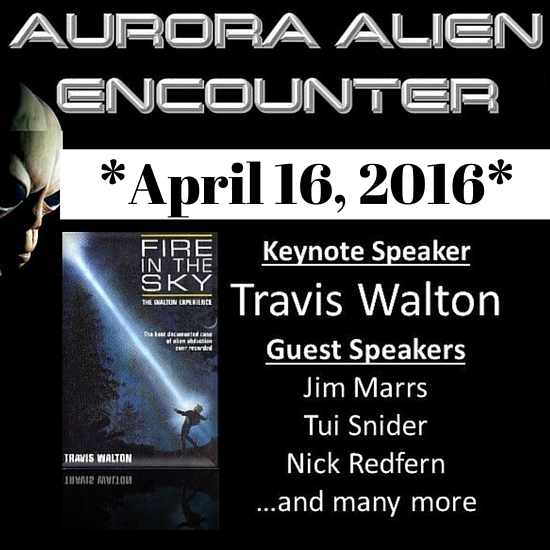 VORTEXAS and the City of Aurora invite you to join us on Saturday, April 16th, 2016 for the first annual AURORA ALIEN ENCOUNTER! This exciting UFO Conference commemorates a strange event which occurred on April 17, 1897 when a UFO crashed and an ALIEN body was recovered and buried in the local cemetery. Even after more than 100 years, this incident still stands out as one of the most extraordinary UFO cases of our time! shuttle tours to the original crash and burial sites! Full list of ticket information here: Aurora Alien Encounter tickets. *Live* Stream of Events for those who can’t attend in person! Can’t make it to Aurora? Watch the conference online! From now through the end of March, it’s only $5 to watch the entire Aurora Alien Encounter UFO conference streaming live online. Ticket information here: Aurora Alien Encounter tickets. Travis Walton: Travis Walton’s terrifying abduction experience in 1973 led to a book and movie entitled Fire in the Sky. For more info, check out: Travis Walton’s official website. Nick Redfern Nick Redfern has written a slew of books, too, including Chupacabra Roadtrip and The Real Men in Black. Nick will be speaking about a variety of bizarre Texas UFO cases. For more info, check out: Nick Redfern’s official website. Tui Snider is a travel writer, photographer, musician, and speaker who specializes in quirky, haunted, and downright bizarre destinations in Texas. As she puts it, “I used to write fiction – but then, I moved to Texas!” Snider’s best-selling books inspired by the Lone Star state include Paranormal Texas, The Lynching of the Santa Claus Bank Robber, and the 2015 North Texas Book Festival First Place Winner, Unexpected Texas. Among other projects, Tui will be the 2016 photographer/writer-in-residence for Tarleton State University’s Langdon Review. She is currently writing a book called Messages from the Dead: A Field Guide to Historic Cemetery Symbols as well as a book about the 1897 UFO crash in Aurora, Texas. Noe Torres: Noe Torres has written several books, including The Real Cowboys & Aliens: UFO Encounters of the Old West and Fallen Angel: UFO Crash Near Laredo, Texas. Noe will be talking about Del Rio, TX UFO crash of 1955. For more info, check out: Noe Torres’ biography. Stephen Andrasko: Stephen Andrasko will be speaking about the real “cowboys and aliens” – UFO sightings of the Old West. I’m super excited about this event and so curious to hear what Stephen and all the others have to say during their presentations! …and other special guests (TBA)! We welcome Keynote Speaker, Travis Walton famous for “The Walton Experience: Fire in the Sky,” for a catered buffet lunch. The chefs of MD Resort are preparing wonderful selections of salad, pasta, dessert and your choice of tea or lemonade. Travel through Aurora in a shuttle to the crash & burial sites with the City Administrator, Dr. Toni Wheeler as your guide! Dr. Wheeler is a native of Aurora. Her Grandfather, Clyde Idell, was born in the Aurora Hotel in 1925. She is a wealth of information regarding first hand accounts of the “old timers” she visited as a child. Learn the history of Aurora’s UFO crash and alien burial in a fascinating documentary with Jim Marrs! You can browse through several vendors with custom goods & services, although I don’t have details about them as of this writing. Contest: Win Tickets by Spreading the Word! *WIN* a ticket to this exciting UFO event! Enter Daily through April 13th, 2016! For your chance to win, simply help us spread the word about this event by following the instructions on the Rafflecopter above! (Sorry – the contest has ended.) Thank you! UNEXPECTED TEXAS: Your Guide to Offbeat & Overlooked History, Day Trips & Fun Things to do near Dallas & Fort Worth . PARANORMAL TEXAS: Your Travel Guide to Haunted Places near Dallas & Fort Worth . Hey, you! Want to come along for the ride? No matter where you live in the galaxy, Tui Snider’s books can take you on a FUN adventure! Snider’s best-selling books include Paranormal Texas , Understanding Cemetery Symbols, and 100 Things to Do in Dallas - Fort Worth Before You Die. Snider has several more books in progress, and enjoys connecting with writers and readers all over the globe through social media, her newsletter and her website: TuiSnider.com. My husband’s birthday is the 18th and he loves anything UFO/Alien related. We watch Fire in the Sky every time it comes on. Trying to find him VIP tickets for the meet and greet. We live 2-21/2 hours from you and can’t wait to listen to your speakers. We plan on general admission and the luncheon.. Wishing for that VIP tho. So excited? I live nearby. It is about time they had a festival like this! UFO Buster Radio wants to attend because it is one of those UFO cases that cannot be explained away by known man made vehicles. Pick me! Pick me! I live in Colorado and I want to win the streaming pass. We’ve seen the grave before the marker was stolen, but we never knew where the exact crash site was. Looking forward to this event. We are coming if we win or if we don’t. I grew up in Ft Worth, but this is the first time I have heard about this. Count me in. 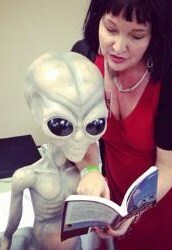 My husband and I are fascinated by ufology. First heard about this strange case from reading your books, Tui! Love your newsletter and all the fun stuff you share. Hoping for one of those streaming passes. Cheers from Canada!